and donors from the larger Tucson community. The screenings were well attended during the two days of the festival with an audience composed of students, CAPLA faculty, other UA faculty, members of the CCP, and members of the general public. Nancy Pollock-Ellwand, PhD. Dean UA College of Architecture, Planning and Landscape Architecture at the inauguration. UA CAPLA, UA CCP, Friends of CAPLA, Student groups: WIAS, TSD, PUENTE. Archdaily, ArtsEarth, deZeen, Bustler, Archinect. Aloft Hotel - Tucson University, Seven Cups Fine Teas, Maynards Market & Kitchen, ZIA Record store, TuGo bike share. AIA Arizona, AIA Southern Arizona. Gensler, Concept Design Lab, Studio Rick Joy, Dust, Matias Zegers Arquitectos (Chile). Etherton Gallery, Museum of Contemporary Art Tucson, Exploded View. San Francisco Urban Film Fest, Urban Eye Film Festival - Romania. Students volunteers at the welcoming table. A large and enthusiastic number of student volunteers helped throughout the festival to guide the audience, providing information and sharing the program of the festival. Likewise, student volunteers from several student groups delivered information from some sponsors near the main entry. During the breaks Seven Cups Fine teas, a local business, offered tea and infusions to the attendees. Post screening discussion, Friday January 25, 2019. Bill Mackey, Laura Hollengreen, Miguel Contreras, Rachel Schultz and Joshua Gleich. Post screening discussion, Saturday January 26, 2019. Miguel Contreras, Ben Lepley, Jasmin Guzman, Elena Canovas and Dan Hoffman. 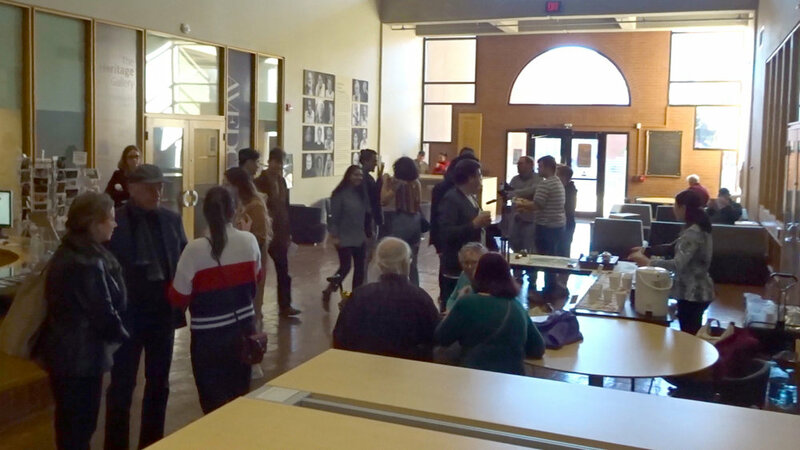 Many people approached the organizers to congratulate them on the effort of making an Architecture Film Festival here in Tucson. “I really enjoyed this opportunity to be exposed to this wide variety of Architectural concepts, it really helps keep the inspiration flowing. Thanks to the organizers! " Eduardo Guerrero, Senior Lecturer in Architecture & Urban Design and Director of the Architecture Film Festival Tucson 2019, wants to make public a special thank you note to Laura Hollengreen and Patti Van Leer who helped tirelessly during four months and during the end of the year break to put on the festival.